Tomorrow I’ll be an educated woman. Yes. With these words… these strong words, UNESCO Director-General Irina Bokova opened a press conference in Paris today. She held the conference at the Organization’s Headquarters to launch the 2010 girls’ education fund-raising campaign “la Flamme Marie Claire”, organized under UNESCO patronage. Noting the powerful dynamism and hopeful message in the campaign’s slogan: “Tomorrow I’ll be an educated woman”, Irina Bokova stated that one of the most urgent needs of our global society is to place women at an equal level with men. “I personally give absolute priority to the goal of education, and education of girls in particular,” she emphasized. 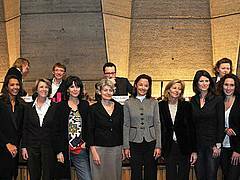 The event was attended by several of France’s most famous women TV presenters who are backing the campaign. Also present at the press conference were: Tina Kieffer, volunteering Director of La Flamme Marie Claire and Founder of the association Toutes à l’école, Jean-Paul Lubot, Director-General of Marie Claire Group and Chairman of the Marie Claire Trust Fund, Christine Leiritz, Marie Claire’s Director, Alain Deloche, Founder and Director-General of the humanitarian association Chaîne de l’Espoir, Christophe Paris, Director-General of AFEV (Association of the Student Foundation for the City).